Ask fellow campers about "Big Pine Campground" and nearby attractions. Stayed one week to visit Mt. Rushmore, Custer SP, etc. We came in from the west from I-90 to Hwy 16. Easy drive into CG. Smooth, friendly check in-owners waiting for us and escorted to site and helped park. There is one main road leading to the lower and upper part of CG. The road is a hard packed dirt/gravel that goes up a gentle hill and was easy to navigate with a big rig. The second part of CG continues on a steeper hill and loops around and this is more challenging for a big rig but doable. All sites are back-ins, angled among tall Pine forest offering nice shade. Our site on lower part, #24, was gravel, FHU, level with a picnic table, fire ring with no cable and 3 OTA channels. All utilities worked well. A lot of space between sites. ATT worked well and CG Wifi was good. Firewood is $4/bundle and they deliver - just call the office or ask owners who are always available and are around CG on ATV's. Lots of deer in and around CG. Two great bath houses: located at lower end and one at the upper end of CG. Lots of space to walk your dog around CG and in small meadows among pine trees. Very relaxing, peaceful surroundings. Laundry room located in main office area. This is a great location, home base, to visit area attractions. We camped at Big Pine Campground in a Motorhome. The city of Custer is minutes away with many restaurants and shops. Small supermarket, Dakotamart, in town. Definitely visit Mt Rushmore during daytime and again for the "evening lighting". Don't miss the Bison, drive the Needles Hwy and Iron Mtn. Rd. Hwy in Custer SP. Great, wide sites. Easy nav in and out. The owners are incredible and go out of their way for the customer. A great place to stay to see the surrounding area. Hook up are well appointed and work fine. Site was a little unlevel. Will definitely stay there again. We camped at Big Pine Campground in a Motorhome. Big Pine is a well run centrally located campground near all of the major attractions around Mt. Rushmore and Custer, SD. Friendly run park by a husband and wife team that are always around. Gravel roads leading up to gravel and mostly level campsite sites. The utilities were very good, 50amp, sewer, water. However, for those that care, no cable. Very very strong Wi-Fi signal though with fast sign on. Bath houses were spotlessly clean with strong water pressure for the showers and plenty of hot water. To visit the attractions nearby, this "IS" a must stay at park. Careful booking parks that are off one of the many twisting hilly (some very steep) road, especially with big rigs. Big Pine is less than 3 miles from the town of Custer, and less than a 10 minute ride to the Crazy Horse Memorial, or Custer State Park, where the bison roam free. We camped at Big Pine Campground in a Motorhome. Big Pine is by most of the name attractions to the area, best known for Mount Rushmore, which is an easy 20 mile drive. Custer State Park, Needles Highway, Crazy Horse Memorial 5 miles away, Jewel Cave 15 minutes ride. Convenient to neat western style towns of Custer 2-3 miles away, Hill City, Keystone and more. Shops, saloons, restaurants. Fantastic low key camping. Most sites are very spacious. Even the ones that are "close" together are still spaced wider than average. The campground is on a hill, but the sites are very level. The owners are just fantastic. He be seen all day delivering firewood, doing chores, and leading new campers to their site and helping get them situated in the site. He made sure our slides would miss an adjacent pine tree. Angie was really helpful in where to find things in town, good places to eat, etc. We didn't use the restrooms but checked them out - some of the cleanest I have ever seen! Wi-fi actually worked and we had good connectivity and decent transmission speed. They have a nice mix of trailers, 5th wheels, motorhome, and tent sites. Our site was right next to the main tent area and there was no problem at all. The campground is very quiet. Occasionally you can hear a group of Harley's or a loud truck on the highway, but most normal traffic can't be heard. We will definitely return when our travels bring us this way. We camped at Big Pine Campground in a Motorhome. Be sure to visit Sylvan Lake, Needles highway, Iron Mountain Road, and the Wildlife Loop. Several great places to eat in town - Don't miss Black Hills Burger and Bun. Angie can fill you in on others. We had read about the friendly husband and wife team that run the park. Unfortunately our experience with them was disappointing. In our four years of rving we had never been treated rudely by office staff or the management in any of the rv parks we had visied at until our stay here. The site we were given had no shade and since there were many unoccupied sites with trees we phoned the office to ask if we could change our site. We were told that other rvs were expected and we could get our money back and find another rv park. We were shocked by her rudeness but did stay there three nights. The most positive aspect of this park was their fantastic wifi - strong, fast and reliable. We camped at Big Pine Campground in a Motorhome. We loved this CG for a 3 day stay. Travelled with another couple and both sites (26 & 27) offered level and extremely spacious sites. Sites were in heavy pine area nestled next to National Park land. Owners are wonderful people. You are escorted to sites and assisted with back-in. Large bundles of firewood sold for $4 and that includes delivery! We camped at Big Pine Campground in a Motorhome. Campstore has a great selection of craft beers for sale. Rustic, all gravel, hills, sites are mostly level. Park manager said park was full last night,6-9-18, very quite. Very friendly staff, lead you to site, spot for backing if needed. decent size sites. All facilities very clean and neat. We would come back. We camped at Big Pine Campground in a Fifth Wheel. Close to Mt. Rushmore and Crazy Horse Monument. I was scared when I saw how hilly the campground was but have no fear--the sites are level. And they provide guidance into your campsite to avoid hitting the pines, which smell wonderful. The owners are amiable and helpful in every way. The campground is convenient to everything you want to see in the region. We camped at Big Pine Campground in a Motorhome. See Crazy Horse (The video is so touching! ), Rushmore, Wind Cave, Jewel Cave, and Custer State Park. Saw bison, prairie dogs, pronghorn, longhorn steer, deer. Kayaked Sylvan Lake. It's all wonderful! But don't take a big RV over the roads like Needles or Iron Mountain into Custer State Park. Take your car and go slowly. Last week we camped at the Big Pine Campground, Custer, SD. The owners were excellent in every way and they took care of all of our needs and more. The facilities were in excellent condition with very good level RV spots with easy access. Showers and bathrooms were very clean and were maintained that way throughout our 4 day stay. The park is located close to Custer State Park but is secluded and private. If we are close to the Custer area in the future we will for sure stay at Big Pine Camp Ground. We camped at Big Pine Campground in a Travel Trailer. Owners very friendly. Restrooms, shower, and entire park very clean. We stayed in the front camp loop which had a good view but heard highway noise. If we are in area again, would stay again but would request the back loop which is more secluded. Big pine trees at all sites regardless of which loop. Excellent Wi-Fi. Quiet in park even though full for Memorial Day weekend. Excellent base for touring Black Hills. We camped at Big Pine Campground in a Motorhome. Awesome place. This is our 5th time here. All the facilities are maintained in best possible condition, the sites are level and spacious, the areas to walk and have your pet seem endless, and the owners are the best of any I've experienced. Black Hills offered lots to see so even though we spend a week + each time we come we still have only done about 1/3 of what we can do. We plan to return next year to this campground!!!! We camped at Big Pine Campground in a Motorhome. So many cool things to do, hard to pick just a few!!! Very nice park,under pine trees,park very clean,friendly owners. Hookups close, easy in and out. Very few over air channels. We camped at Big Pine Campground in a Fifth Wheel. Located close to town of Custer,Custer State Park, Mt Rushmore and Crazy Horse monument. We loved this park. It's in the tall trees, but you can still see your neighbors. The space was so level, we got it right the first time we backed in, and didn't have to use any blocks or anything. The people running the park are terrific. They guided us to our spot, and the next day, they brought our firewood to our space for us, while we were running around. We will definitely stay here again when we return to the Black Hills. We camped at Big Pine Campground in a Fifth Wheel. The city of Custer is minutes away with many restaurants and shops. Small supermarket, Dakotamart, in town. Definitely visit Mt Rushmore during daytime and again for the "evening lighting". Don't miss the Bison, drive the Needles Hwy and Iron Mtn. Rd. Hwy in Custer SP. Restaurants we liked: 1881 Bank, Baker's Bakery cafe, Pizza Mill, Custer Wulf, Bugling Bull, Cowboy Cafe, Begging Burro, Black Hills Burger and Bun, Dakota BBQ. Custer is pretty convenient for visiting the local sites and Devil's Tower and the Badlands Scenic Loop are manageable as a day trip. Within a few minutes drive to Custer Park, Crazy Horse and Mount Rushmore. Convenient to all the adventures of the Black Hills. Grocery store and Custer restaurants are convenient. We used this campground as a base for visiting Crazy Horse Memorial twice, Mt. Rushmore, Custer State Park (Needles Highway, Iron Mountain Rd. and the wildlife road tour), also visited the Norbeck Wildlife Preserve and the Norbeck Overlook Black Hills National Forest (a good place to walk the dogs). Got takeout food along with pie and ice cream at the Purple Pie Place in Custer. Lots of places to go. Good fishing in Custer State Park. Good restaurants in town (just 2 miles away). Black Hills Burger and Bun is ranked the #1 restaurant in Custer and offers buffalo burgers if you choose. Custer Gas provides propane at 1/2 price on Thursdays. Lots to do while in the area. Good location explore from. The area is filled with attractions--Crazy Horse Memorial, Mt Rushmore, Needles Hwy, Custer State Park, the unique town of Custer and many more. Close to Mt Rushmore and Crazy Horse Monument. Liked the town of Custer SD. The Needles highway is a must see if you love amazing rock formations. BUT, you can only do it in a small vehicle. Our full size dual wheel pickup barely made it through the small tunnels. And if you love wildlife, definitely spend time on the Custer State Park Wildlife Loop. We saw lots of bison, pronghorns, prairie dogs, burros who go right up to you car window and beg for food, and a few deer and big horn sheep. We missed the entrance to the campground because Big Pine Road is not marked. The campground is located off a side road and there is no directional sign from the highway. Our GPS indicated the entrance was located off the highway. Custer State Park, Crazy Horse, Mt. Rushmore, Town of Keystone are all nearby. If in Keystone, dining at Ruby's is a must !!! Close of all sorts of attractions: Custer State Park, Crazy Horse, Mt. Rushmore, etc. Used this as our base to branch out and explore the SD area. We were given a map of the area with great roads to explore. We hauled our Harley in our toy hauler and rode to every scenic attraction available on the west side of South Dakota. Very centrally located for the tourist and the town of Custer in minutes away. There are two breweries and three wineries in the area that are worth visiting. Excellent location for visiting Black Hills, Custer state park, Mt Rushmore & Wind Cave NP. Convenient to all the Back Hills attractions. 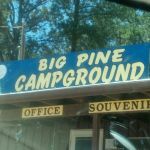 Are you affiliated with Big Pine Campground ?